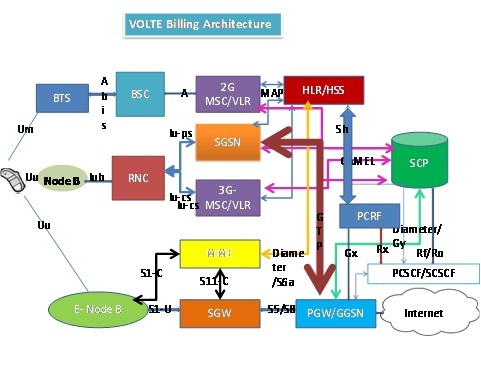 This is a guest post by Saurabh Garg, assistant vice president technology and Karthikeya Ganapathy Chockalingam, senior technical leader at Aricent Group and explains how the delicate work of charging is done for VoLTE when all information is data. Charging is an important aspect for VoLTE calls and a must for commercial deployment— but it literally pays to get it right. As the same session flows through PGW in LTE network and IMS core there is a danger that subscribers could be double charged for both data and voice for the same call. IMS nodes provide the necessary means to solve the billing issues. During the SIP call establishment or message transaction IMS nodes generates an IMS correlation id for each and every event. IMS correlation ids are included in the CDR for each VoLTE calls. During dedicated bearer establishment for VoLTE calls PCSCF and PGW exchange ICID and GCID through PCRF Rx/Gx messages. Based upon VoLTE APN bearer establishment PGW can redirect all the VoLTE charging information to a different billing server to avoid double charge of voice and data sessions. ICID and GCID in CDR help to correlate the call in the IMS and access network. IMS charging information is transferred to billing system through Diameter or ISC interfaces. Single call with different access legs can be easily correlated by billing servers since all the calls are anchored by IMS. The LTE North America conference is taking place on the 14-15th November 2012 at the Fairmont Dallas Hotel, Texas. Click here to register your interest.